What season saw us record our highest ever average attendance and what was the lowest? On the figures I have, the lowest ever average was 1,500 in season 1902/03. The problem is that reliable figures were not available prior to 1920 and after that date it would be the 3,204 in our first ever season in Division 4 in 1985/86. The following season, which ended with The Orient Game, would have been around the 2,700 mark were it not for the massive crowd that attended our last game of the season and pushed the average up to 3,342. The season following The Orient Game saw attendances almost doubled to 6,282 and that is by far the biggest season-to-season percentage rise we have had. The largest average was 33,621 in season 1947/48. That is probably not that surprising when one considers it was our first season back in the top flight for 17 years, we had a good season finishing 3rd, and we had been to the FA Cup final the previous season. Of other notable seasons in our history we had 31,535 in the record breaking Championship season of 1920/21 which beat all previous records by some distance and remains our 2nd ever highest average. 1959/60 saw an average of 26,978 and the ‘nearly’ season of 1961/62 had 27,125. 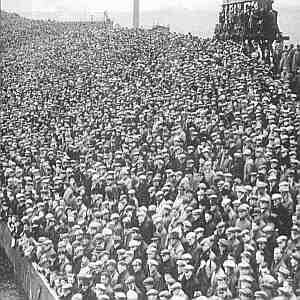 If any proof was needed about the pulling power of the FA Cup the Clarets record single match attendance of 54,775 occurred in the competition of the 1923/24 season when our league average was 14,890. In more recent times, season 2000/01 had us at 16,234 and 2001/02 at 15,947 which compare fairly well with the 19,641 we had in our last most successful season of 1973/74 when we finished 6th in the old Division 1. You are probably going to hate this or rise to the challenge! Assuming 3 points for a win, is it true that the Turf Moor crowd has been worth a point a game over the years? Which other clubs would be top and bottom of a league based on how the points differential helps them? Up to and including last season we have played a total of 4,162 games or 2,081 home and away. Our home record is won 1129, drawn 451, lost 501, average points per game 1.84. Therefore to answer your question, in 103 seasons, being at home has been worth 0.89 points per game when compared to away matches. There is no way I’m going through all of them and working out proportions but of the teams with a relatively long history Man Utd have won more games at home than anyone else and Lincoln City have lost more at home. What is going on with Anthony Shandran? I was expecting him to make an impression this season. I have followed ‘Shandy’s’ career since I saw him score the fastest goal I have ever seen with a clinical finish after about 5 seconds of a youth game once and from that moment on he really was one I thought would make it is a pro. Unfortunately he has made only 1 first team appearance, coming on as a substitute in a 4-2 defeat away to Crewe Alexandra on 3/2/01. Apart from that he has not played or been on the bench in a single other competitive match. He has though been loaned out to Irish team St. Patrick’s Athletic and Stalybridge Celtic. With the problems caused with the loss of money from ITV Digital he may well have earned himself a place on the bench for the Clarets this season and perhaps been given the opportunity to impress if he got on the pitch. This makes his injury seem even more unfortunate for him personally and for us as a club. Whether he can recover in time to make an impression this season remains to be seen but it is probably unlikely. His contract is up at the end of this season and it must be doubtful, if the financial problems persist, that he will be offered a new one. Were that to happen it would be a crying shame for a truly talented young player. Are there any players that have played for all four of the current Lancashire football teams ie: Burnley, Blackburn, Preston & Blackpool? Starting with the players who have played for 3 of the 4 teams we reckon they are: David Eyres, Mike Conroy Gary Parkinson (all for Burnley Preston and Blackpool) and Adam Blacklaw, (Burnley, Blackpool, Blackburn). 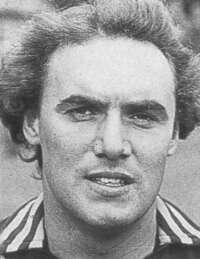 Mark Patterson came close as after appearing for Blackburn and Preston he was signed in the summer of 1997 by Adrian Heath, subject to a medical and actually had some publicity photos taken wearing a Burnley shirt. Before the medical could take place Heath left to join Howard Kendall at Everton and the board cancelled the transfer. He subsequently played for Blackpool on loan. 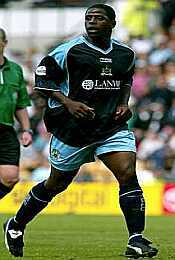 There is one player to have played for all 4 clubs and that is Lenny Johnrose. He played 20 times for Blackburn between 1988-92, once for Preston in 1992 whilst on loan, and has now played 50 times for Burnley. He played for Blackpool in a couple of pre season friendlies and whilst they were not competitive games and he was not signed to them in any way we reckon he is the closest to all 4 you are going to get. Where did Damien Matthew go? Is he still playing? Damien joined Burnley from Crystal Palace in July 1996 for a fee of £65,000. 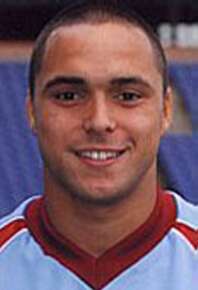 He played in 35 league matches for the Clarets before being released on a free transfer in June 1998. During that summer he joined Northampton Town but only 30 minutes into his debut for them he suffered a serious back injury. He eventually announced his retirement in November 1999 after failing to recover from that injury whilst still only 29 years of age. I always remember him for the brilliant cross he supplied for Andy Cooke to score the winner against Plymouth Argyle in the crucial relegation match on the last day of the 1997/98 season and that match proved to be his last in a Claret shirt. After retiring he returned to live in his native South East and the last I heard was working with the Youth Academy at Chelsea, one of his former clubs. He occasionally works as a Match Summariser for Radio Lancashire when the Clarets are playing in the south. Are there any players who have played for Burnley in the top and also the bottom division of the time? Amazingly there are 5 - Leighton James, Derrick Parker, Billy Rodaway, Joe Jakub and Tony Morley. Rodaway and Jakub hold the additional distinction of appearing in all 4 Divisions of the Football League for the Clarets. It took Rodaway 14 years to achieve the feat and Jakub 16 though both played for other clubs in those periods. If I was being really picky, which I’m not, I could say that Jakub never played in Division 3 for Burnley as when he played in 1992/93 it had been reclassified as Division 2 due to the formation of the Premier League. Could you tell me what was the Ajax line up when we played them in a friendly in 1992? This is one I’ve been struggling with as their exact starting line up does not appear in the archives. There is a picture of the starting 11 and from that and the reports I have been able to unearth I can say that the following played: Michael Reiziger, Edwin Van der Sar, Sonny Silloy, Danny Petterson and Ignacio Tuhnretus. I am also fairly sure that Edgar Davids played but I can’t be 100% sure about that at this time. Unfortunately the match programme does not help as that only includes the squad and most of their better known players at the time were away preparing for Euro '92. The match was arranged by former Clarets chairman Frank Teasdale who had business connections in Amsterdam and it was a fitting finale to the 1991/92 4th Division Championship season. The match was watched by 10,746 fans and Ignacio Tuhnretus scored the only goal of the game with 7 minutes remaining. John Francis had Burnley’s best effort but Van der Sar managed to beat away his close range shot. The game was pretty much a friendly sort of affair but the Clarets in attendance probably still can’t get out of their head the sight of a young, beanpole Edwin Van der Sar dressed in a shocking pink/black chequered shirt and shorts. This question has now been fully answered with a picture and the full Ajax line up appearing on the Updates and Unanswered questions page.